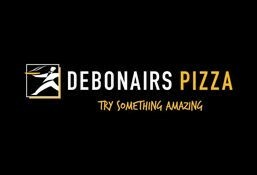 Debonairs Pizza is currently closed for delivery and it will open at . Any 2 medium pizzas (26 cm), 3 Pepsi cans and any Sub or cheese and garlic bread. Green pepper, jalapeno, sweet bell pepper and sriracha sauce (very spicy). Chicken, jalapeno, sweet bell pepper, tomato, sriracha sauce (very spicy) and spring onion. Pizza base, pizza sauce and mozzarella cheese + your own choice of toppings. Olives, pineapple, onion, tomato, spring onion (28cm).